Contribute to the preservation of Bavaria's cultural heritage! The Bavarian palaces, castles, residences, artists’ houses and gardens are the jewels of our state. Help us preserve Bavaria’s cultural heritage! 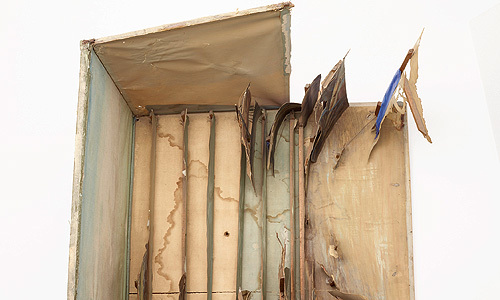 The maintenance of historical sites is extraordinarily complex and expensive. The entrance fees cover only a fraction of the maintenance costs, which are borne by the Free State of Bavaria. Your donation will help to save historical buildings, unique works of art and magnificent parks for future generations. Every contribution is valuable and particularly welcome! Donations can be made online by debit, credit card or instant bank transfer. Simply use our donation form. Donation receipt: In Germany you don’t need a special receipt for donations under 200 euros; German tax offices accept a copy of your bank transfer form instead. For donations of 200 euros and over you will automatically receive a written donation certificate. With your donation you will be supporting current restoration and maintenance projects of the Bavarian Palace Department. "Room in the captain’s house"
"A bay with a rocky shore"
"Meadow on the bank of the River Scheldt"
A stage set model is a scale reproduction of a stage set design. It gives an idea of the space involved and greatly facilitates communication between the actors, set designers and director. The dramatic action is given a spatial dimension and the planned staging becomes much clearer. In the era of Historicism, a stage set was also a visualization of history. Consistency between the time and action of the work and the style of the set and its requisites was thus very important. This was when highly-skilled scene painters, who had never before had to cope with such comprehensive requirements and never would again, really came into their own. 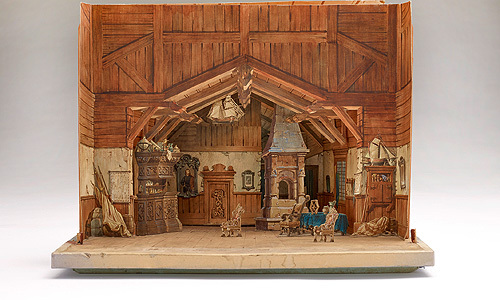 The Bavarian Palace Department has a collection of 32 stage set models which were made in the 1860s and 70s for King Ludwig II. 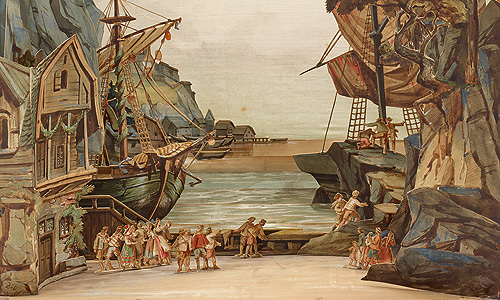 They are designs by the scene painters Angelo II Quaglio, Heinrich Döll and Christian Jank, who also sometimes produced preliminary studies for Ludwig II’s palace projects in addition to their theatre work. The models were primarily made to prepare the Bavarian king for the performances of Wagner operas. Coloured and accurate, with not a single detail left out, some of the models not only illustrated the staging of the (Wagner) performances for Ludwig II, but also functioned as 3D designs for the king’s palace projects. He kept them for documentation purposes and also because of what they meant to him personally. 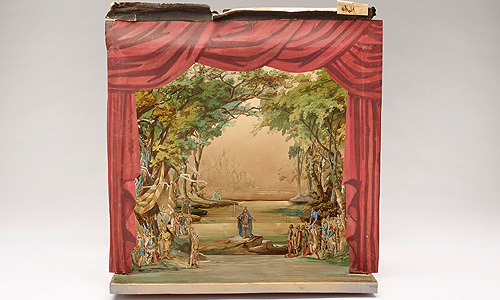 It is now very fortunate that he did, because very few historical stage set models – important records of the production style of that time – have been preserved. One of the results of the degree of clarity Ludwig II expected from the models and the demanding standards he set in general was that the illusion techniques of the Bavarian Court Opera House (today the State Opera House) ranked in stage circles as the best of their day. 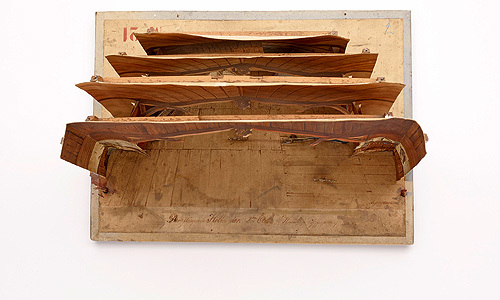 The approximately 45 cm x 60 cm x 30 cm models were primarily made of cardboard, wood and paper and decorated with illusionary gouache painting; in some cases even glass and metal were used. The planned restoration will involve thorough cleaning, the stabilization of mechanical damage and the replacement of missing parts. 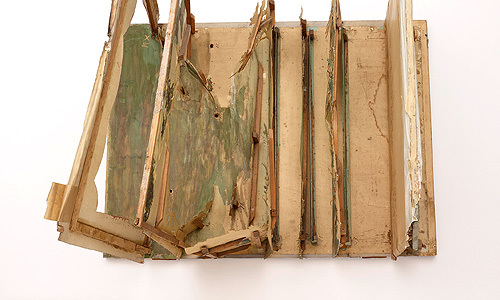 Of the over 30 stage set models in the possession of the Bavarian Palace Department, we would like to restore three models this year in order to put them on display in the Ludwig II Museum. 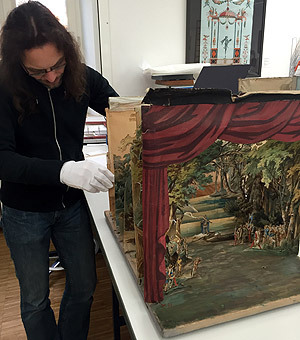 The donor of the total sum of 2,000 euros for the restoration of one stage set model will be given a private preview: this will consist of an exclusive tour of the Bavarian Palace Department’s paper restoration workshop and a prior viewing of the newly restored work of art together with the experts involved. All donors will be mentioned by name on a small plaque next to the model in the museum.